Top 10 blockchain Use Cases for Electricity: Which Will Win? Payment and Settlement Platforms: Building on fintech blockchain innovation, energy financial transaction platforms are an obvious application, especially in the sleepy, fax-dependent (not even a joke) wholesale markets which are begging for disruption with smart digital contracts and bilateral trades. There are non-trivial challenges at the electricity distributed level with measurement, verification, reconciliation, and settlement that will likely require some sophisticated high performance database architecture functioning in concert with blockchain, but that is a topic for another discussion. This is also where consumer empowerment to choose not only their energy provider but even potentially their producer will come rearing its head…I would be worried if I were a retail electric provider with little more than marked up commodity electricity to sell. Demand Response: Demand response markets continue to be weighed down by antiquated pricing and payment systems, despite the growing recognition that, as FERC put it, “negawatts are megawatts.” Growth in demand response capacity is projected to make its slow march upward (see Navigant’s projections here), but a seachange could take place if DR resources could simply be paid in a timely manner. There is often a delay of months between the utilization of DR resources by grid operators and the payment for those resources to those who generated the value. Imagine your employer told you one day that your paycheck would be delayed six months for services rendered. Not a fun conversation back at the homestead. Blockchain has the potential to solve some of these challenges using secure smart digital contracts and near real-time measurement, verification, and settlement. Renewable Energy Certificates (RECs): First, let us recall that a REC is an environmental attribute, not a physical product delivered to a buyer. This attribute is decoupled from renewable electricity generation and conferred to a purchaser using a series of contracts. Tracking these sometimes elusive RECs can be a chain-of-custody nightmare. It is also an excellent use case illustrating how tokenized digital assets can be tracked in complex supply chains (broadly speaking) using blockchain technology and smart digital contracts. The process of certificate issuance, tracking, and retirement may never look the same. The Energy Web Foundation is focusing on this problem domain as one of its first tasks. Microgrids: If there is any silver lining on the cloud of our recent spate of natural disasters, it may be that microgrids have come into the spotlight as a key strategy for ensuring greater grid resilience. 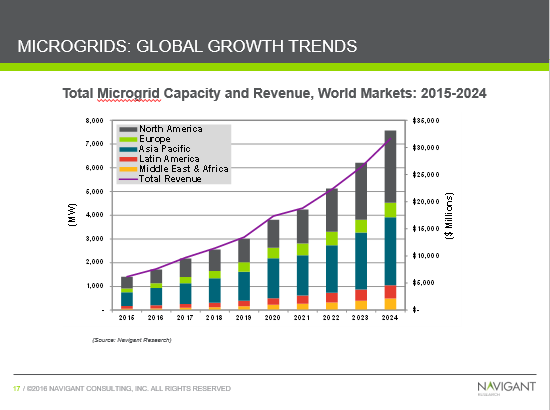 Their popularity is growing (see Navigant’s projections here) as people recognize that microgrids can also lower energy costs, defer costly transmission, and mitigate supply chain risk. They function much like virtual power plants (see #5), except that there is an additional internal microgrid supply/demand balancing function to perform. The distributed ledger blockchain architecture can provide a needed public accounting function working in conjunction with an external microgrid control system. This can allow microgrids to be more easily integrated into larger regional or national electric grids. However, where microgrids have really come into play is with behind-the-meter peer-to-peer energy trading (see #7). Virtual Power Plants: No, this has nothing to do with virtual reality, as cool as that would be. Virtual Power Plants (VPPs) are aggregations of distributed energy resources (DERs) that, you guessed it, can be managed virtually using cloud-based software to provide greater grid resilience and flexibility. Easier said than done. It is a classic case of eight hundred one-pound gorillas in need of coordination in order to be of any value to the grid. Forecasting and optimizing power flows for little one-pound gorilla DERs is being tackled, but data management and communications need to be streamlined. Blockchain applications could be used to better integrate and process local information and deploy smart digital contracts for power flow optimization so that VPPs can be more than just a science fair project. Electric Vehicle Charging: Tracking and billing EV owners for charging their Jetson cars outside their smart homes has spawned a new class of free-riding eco-drivers. And there are more and more of them (see Bloomberg’s projections here). I feel envious every time I am pumping gas. Enter the EV billing police, who will ride their blockchain-powered patrol cruisers looking to snag, identify, and bill EV drivers no matter where they are charging their snazzy cars. Similar to the REC story, blockchain can solve the driver/car authentication problem thereby enabling measurement and payment systems to accurately administer a bill anywhere and anytime an EV driver hooks up to a charger. One applicationthat I find very cool is essentially an AirBNB for your home charger system that allows homeowners to allow EV owners to charge their cars on the fly. P2P Energy Trading: This area has easily received the most love, yet it may also be one of the more limited applications in the near-term. The vast majority of startups in the energy + blockchain space are trying to enact some form of peer-to-peer energy trading. The appeal is obvious in a world demanding greater energy choice. Want to buy or sell excess rooftop solar generation with your neighbors? Offer up a smart contract on the local private blockchain and automatically execute when market conditions line up. This can work at small scales on the order of perhaps dozens of homes in microgrid-like settings. However, what happens when you want to trade with someone outside of your nifty local neighborhood microgrid? Well, you have to deal with the existing markets. One solution is to mint a coin (see #8) to create your own market to bypass the existing markets, but this is fool’s gold, at least at present. The other solution is to build an interface with existing markets and settle accounts at the distributed level. Many startups in this space do not appear to be grappling with this problem in earnest, because it is a beast and you have to continue working with “the man.” My take is that we are not close to displacing our current system with P2P energy trading, so better figure out a way to play nice. Ponton, an innovative Danish blockchain B2B company, wrote an excellent review of the potential of blockchain-based energy trading, but don’t drink all the P2P juice! Energy-backed Cryptocurrencies: Call me a skeptic here, but I fully admit I could be proven wrong over time. Energy-backed coins or tokens (cryptocurrencies) have been used to raise a bunch of money for various energy + blockchain companies (literally hundreds of millions of dollars). So, in that respect, this idea has been a success. The general proposition is that a coin or token is minted (created out of thin air) by a company, which backed by a consumptive good like a kWh from a solar farm. Putting on our economist hats, we can see that for the concept to work, the coin or token has to have exchange value outside of just the good or service that is backing it. In other words, you have to create a functioning market in which buyers and sellers are motivated to exchange value using this newly minted coin or token. More consumers demanding, purchasing, utilizing, and trading coins, and more producers generating electricity (or other goods) in exchange for coins, selling those coins for other cryptocurrencies, and then monetizing those cryptocurrencies outside of the exchange. Perhaps the network effect will sprinkle fairy dust on these schemes, and all of sudden we have long-term, viable energy-backed cryptocurrencies. Again, call me a skeptic in the short-term. Transactive Energy: This is where things get a little energy nerdy. Transactive energy represents your wildest Internet of Things (IoT) fantasy on an electric grid. Smart, automated, real-time energy trading and grid management driven by algorithmic price discovery bounded by user preferences and grid requirements. Wow, that is a lot to imagine all at once. And that is really the challenge with Transactive Energy. The promise is just immense, but there are a million little agents (think: DERs, IOT devices, meters, etc.) that need to be orchestrated in harmony with the physical requirements of the electric grid in order for it all the work. Blockchain can provide the connective transactional tissue to enable this vision to come to reality, but it will take time. See this great overview of Transactive Energy from the National Institute of Standards and Technology (NIST). Blockchain may not be the ultimate cloud-based Swiss Army knife to support the transition to a more distributed, digital, secure, and renewable electric grid, but it certainly has some appealing and tangible use cases and applications. One of the more encouraging developments is that it is not necessarily every (wo)man (think: startup) for themselves. Blockchain has also inspired a bevy of profit-averse consortia working on all manner of interesting initiatives to support the energy + blockchain space. The Energy Web Foundation(previously mentioned), HyperLedger, and Enerchain are among the most prominent efforts, each of which is backed by a veritable who’s who of corporate behemoths. Stay tuned…it will certainly be a fun and entertaining ride.